I managed a few sketches this month, unlike last month. The rocky peak that was the goal while having lunch after being thwarted by the vegetation. One in the dying light of the evening while claiming a monument. 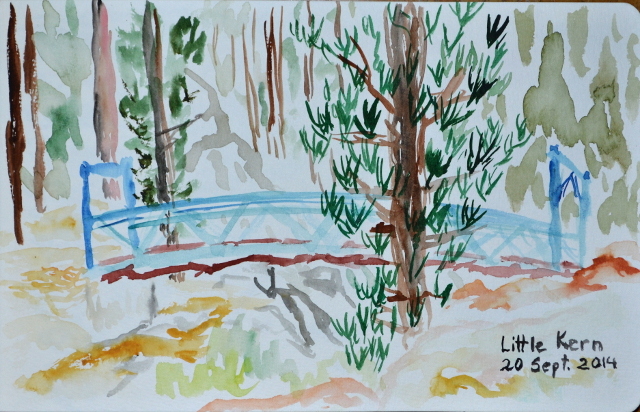 Circumstances made the first day backpacking short, so I painted the bridge. 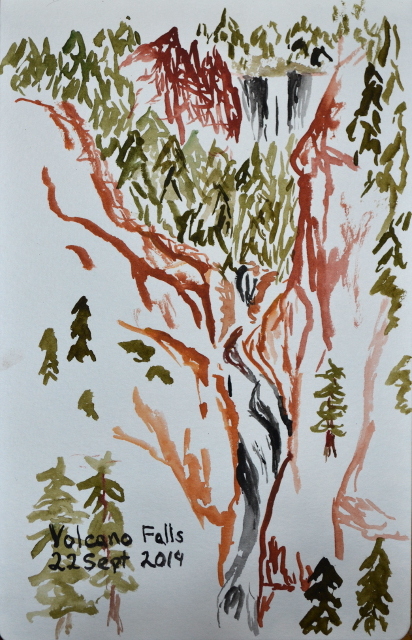 I had to take a bit of time to take in Volcano Falls, so got out the paints. 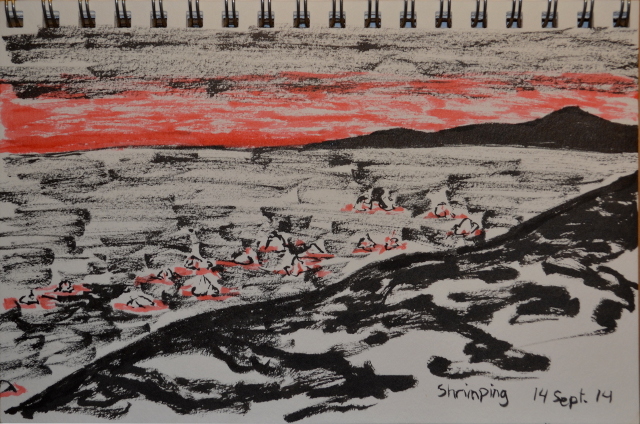 In the evening after soaking in the upper pool at Jordan Hot Spring, I sketched the one with a little waterfall of hot water into it. 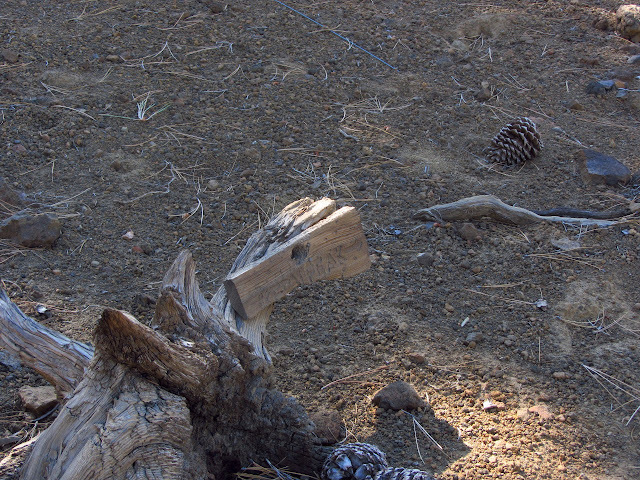 (Day 8 of 8) A little poking around find the remains of a dead horse left just up the hill from the trail and the trail that cuts across to the Little Kern River from Willow Meadows. Away from the camp, the trail is quite obvious as it climbs steadily, once needing a little switchback. The area is burned at the top. 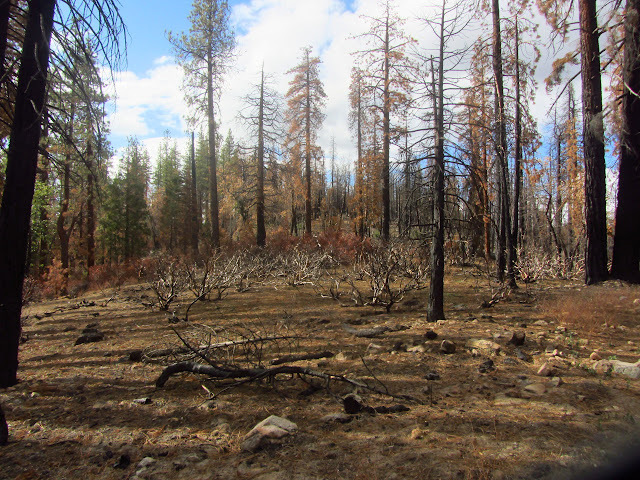 Coming into the burn area and finding the manzanita almost completely gone. (Day 7 of 8) My attempt at getting some sun in the morning has failed as my camp is still deep in shadow as the buildings and trees across the creek gain the sun. The original plan has three days to hike out, but that was really to give an extra day "just in case". Under normal circumstances, I would hike most of the next two days in a single go and the mention of the first weekend of hunting season provides a little extra motivation to get out earlier. With a reasonably early start, I should be able to get down to Kern Flat and loaded with water by 1PM. If I start the "six mile climb" back out of Kern Canyon, really only 1500 feet up, I should be able to stumble into a camp I know has water by sunset. The GPS shows sunset is somehow half an hour earlier than it was when I started this trip. The days really are growing shorter quickly. First, I need to get started even though the sun has not hit the flat. One or two mornings have been near freezing, but this one could not be below 40°F by the feel, yet somehow a few yards down the trail I am walking over a once soggy but now frozen solid piece of ground. It is a curious place. The hike down is almost entirely bad burn area and there are few places where it feels safe to sit. Some hillsides have new trees growing up among the toothpicks, but far too many look like the forest has been lost. A few late season flowers. (Day 6 of 8) Today is a very easy day. The morning is to be looking for monuments around Casa Vieja Meadows and wandering three miles or so down the trail. The afternoon is to be sitting in the hot springs and exploring old cabins from when it was a commercial concern. The morning sun on the meadow is stunning, and after some battling with the camera in need of a new battery, I can capture a slightly lesser moment of the light. Then, with breakfast put away, I turn my attention to climbing the small peak just north of my campsite. Manzanita makes a feeble attempt to block my way sometimes and I am quickly into a cold wind, but soon find myself on Doc Peak, as it is labeled in the OpenStreetMap. It is another labeled with a benchmark on the 1905 Olancha 30' map and on the more recent 1987 Casa Vieja Meadows 7.5' quad. The benchmark is there, but has met with some tragedy. There are also two irregular logs that look like they have been placed upright in the rocks north and south of the benchmark. There are also dead trees propped up in cracks, but these two logs are distinctly different. 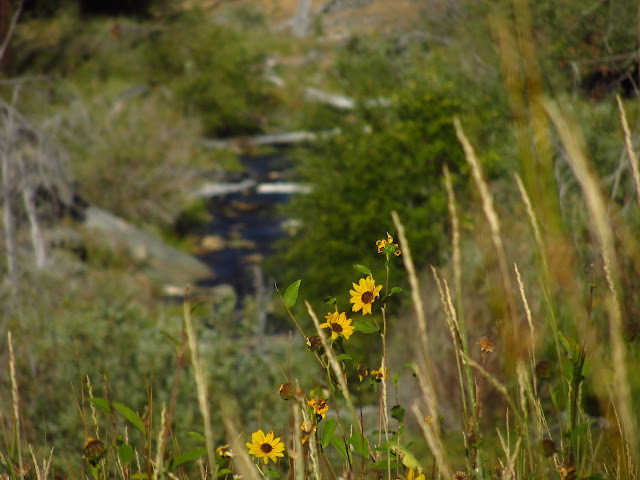 Ninemile Creek snaking through Casa Vieja Meadows in the morning sun. 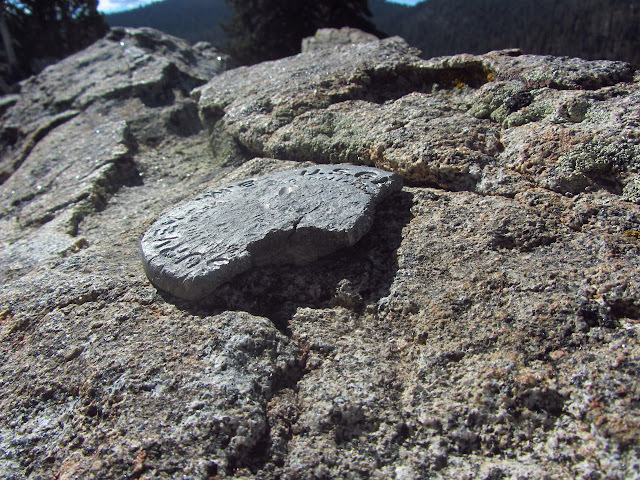 Another USGS elevation benchmark that may date back to 1905 or earlier. Although it is cracked and missing a third, the stamp of 8750 for the elevation can still be read. There is no year stamp. (Day 5 of 8) A good study of the map while having supper for breakfast suggests I am hanging out by Movie Stringer. One of the guys with the stock had suggested I should try to get down into it for water. Looks like he had a good idea there, although he also thought I would be traveling through Ramshaw Meadows for a bit but I only got close enough to see it through the trees briefly, and thought Ramshaw Meadows would be my last chance for water before the peak so did not know about all the water in the Kern Peak Stringer. The trail up to the peak shows much less evidence of stock travel than the other trails, he probably has never actually gone up it. He said there was a corner in Ramshaw, too, so at least one of the three I have found marked on the map is really there. I want to poke around Templeton Cow Camp where there should be a weak corner, so pop over the hill to the southwest to find my way back to the network of trails. It takes longer than expected, but soon enough, just after almost tripping over another telephone wire, there is a bit of trail. I expect I want to turn right to get to the cow camp, but make sure with the map and GPS. As they say, "measure twice, cut once." The map confirms, and it is only a few hundred feet before an intersection and another few hundred feet to the cow camp. Templeton Cow Camp looks more like an old homestead and remote ranger station. (Day 4 of 8) The early morning comes with burning eyes and a stuffed nose and allergy medicine only partly helps it. It is a very poor sleep after not particularly good sleeps. My start is late, but I am not in much of a hurry. 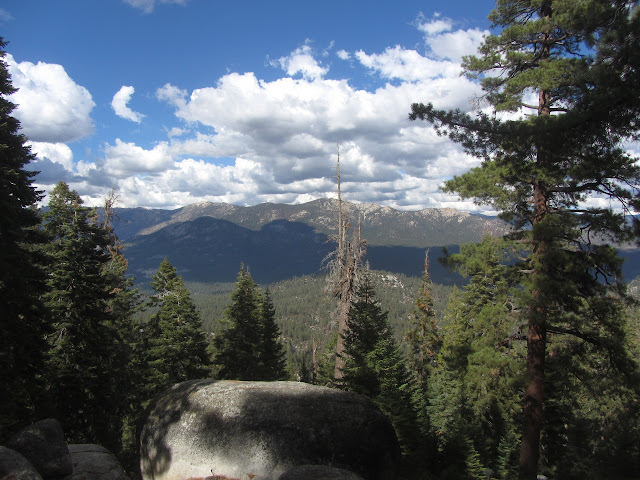 I have a 5.6 mile climb along trail to get to the top of Kern Peak and an even shorter way down, hopefully partly on trail, to get down again. Once packed up and supplied with a bit over 2L of water, it is time to climb slightly and find the faint, but clear trail along the top of the slight hill I was sleeping on. It seems to take random turns as it wanders through the trees past yellow painted tin can tops nailed to the trees. Sometimes another, even fainter, old route can be seen beside the current route. The trail drifts up to a saddle this way, then splits. 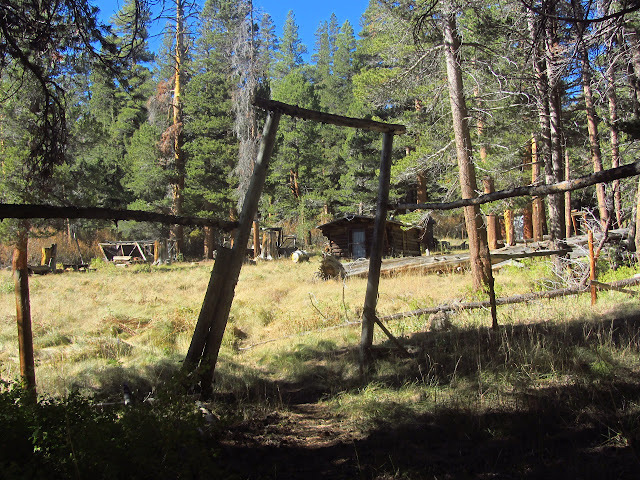 A "Kern Peak" sign nailed to a short stump points downhill steeply, while the other trail initially follows an old piece of single line telephone wire and probably heads over to Ramshaw Meadows. Not the typical sign post. 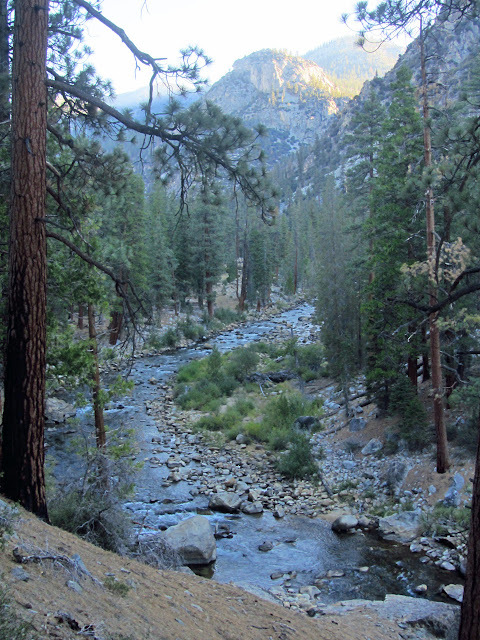 The trail crosses one creek, then follows the Kern Peak Stringer up for a while crossing it a couple times. I had figured I would have no access to water once I left camp, but there is good flow in the stringer. It smells of cow as the trail makes the last crossing at the bottom of a small meadow. It is odd because the lower meadows have not had any cows for long enough that the stink has left them. It might be easy to miss the trail climbing up just inside the trees near the meadow instead of continuing to follow the stringer along some use trail. Once it starts climbing, the trail seems serious about getting higher and the views start to open up. Looking back at the high meadow that the trail clips the bottom of. 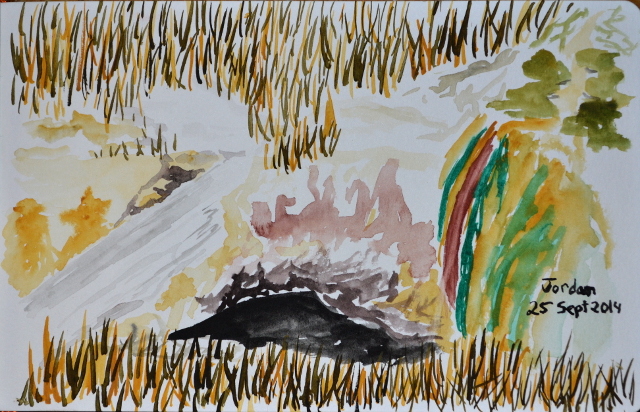 (Day 3 of 8) The deep canyon of the Kern River stays in shadow a long time. While eating breakfast, I realize that one of the trees beside me with bark like a redwood actually has pine needles as well. The other trees are more cedars, but I have finally found a redwood among them. It is a little one that would only require a couple people to give it a hug. Hiking out, it continues to be a gentle slope up the river, but the river returns to an obviously churning and roaring thing as things get rocky again. I can see a large break in the canyon ahead on the east side which will be my leaving point. There is a bypass trail for "visitors with pets and weapons" or just no need to go to the national park, so I take that. Sun coming through the break in the canyon for Golden Trout Creek to come down into the Kern River. It is with apprehension that I approach the river crossing in the still cold morning air. No one mentioned a bridge up ahead. Crossing one last creek and coming around the corner, my fears are laid to rest. There is a bridge looking much like the one over the Little Kern, only appropriately larger to traverse the larger river. 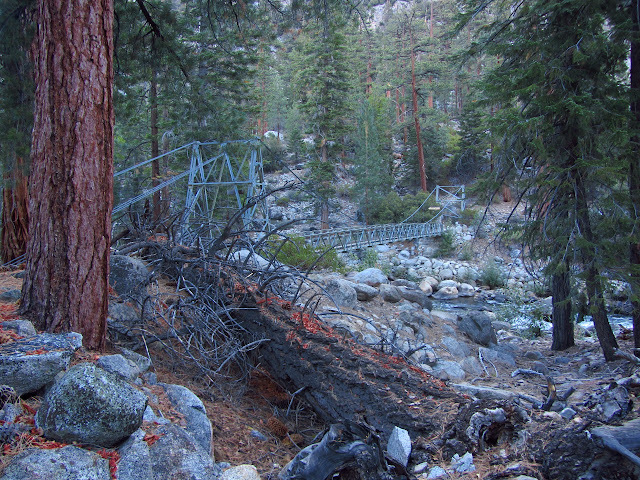 Another blue suspension bridge to cross the Kern River. 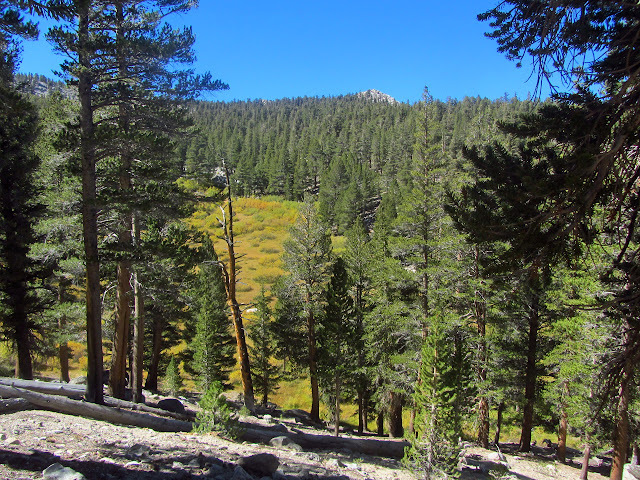 Sign boards hanging from it mark the crossing of the boundary between Sequoia and Inyo National Forests. The trail climbs shortly, then progresses along a sandy flat. The sand slows movement, but is left behind as it starts to climb again. Big switchbacks narrow down as it works its way up between a granite cliff and lava of the same sort that makes up Devil's Postpile to the north. One last look up the Kern Canyon for a while. (Day 2 of 8) It is neither early nor late as I get started on the day's hiking. I need to make up four miles. Two trails are supposed to leave from near the bridge and go to Willow Meadows, according to Tom Harrison. As I follow the one trail I can find, I can faintly see a track leading steeply up the other side of the little canyon it has just traversed, but nothing that looks like trail. A little further is an unsigned, but real, junction for the shorter route that I hike right on past. 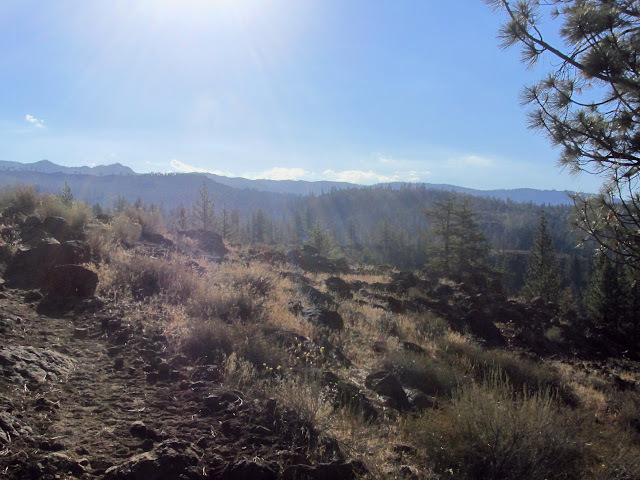 This keeps me on a fairly level and easy route around the edge of old lava into Trout Meadows. 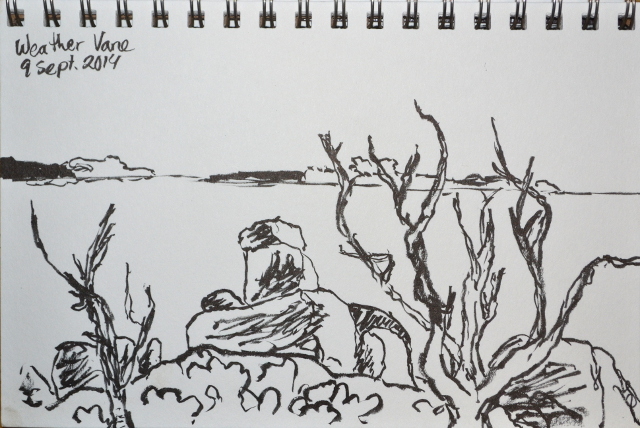 The nearby roar of a chain saw adds to the wilderness noises, going for a short time and finishing again. Looking out over the old lava flow in the morning sunlight. 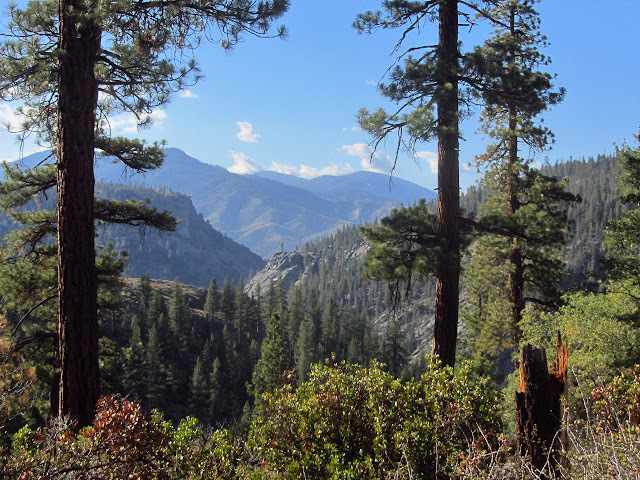 Looking down the Little Kern River valley. There is another junction, this time signed, then I am upon Trout Meadows. The majority of the meadows are fenced for an inholding and a number of horses are grazing the grasses. This is likely the source of the noise. Further up the meadow is a ranger station and the flag is flying today. Springs pour water out of the ground in the middle of the horse pasture, but above there the meadow seems dry, which is what the water report for it claims. 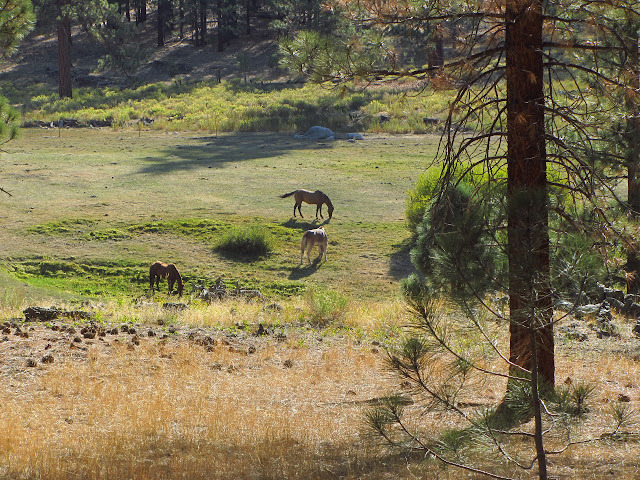 The horses grazing on the fields of the inholding in Trout Meadows. 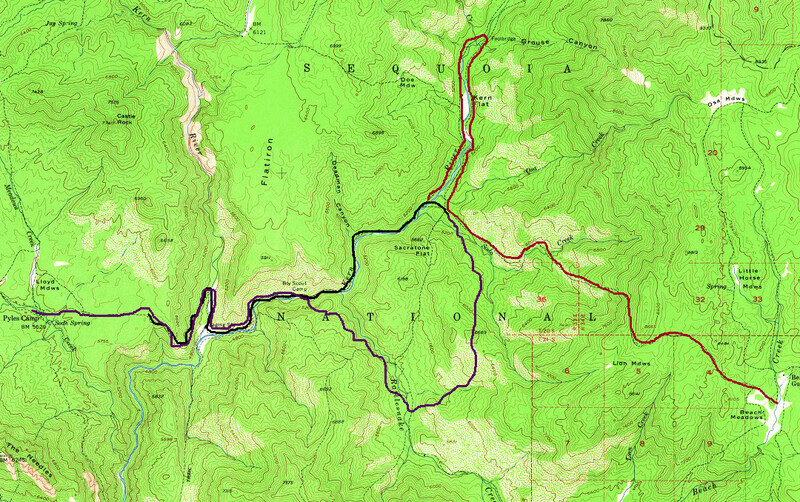 (Day 1 of 8) I got it into my head to do a good look around of the Golden Trout Wilderness. I have made my way through a corner of if and looked down on its expanse from there, but never come down into its expansive meadows and plateaus. A basic loop for such a journey can be found here. 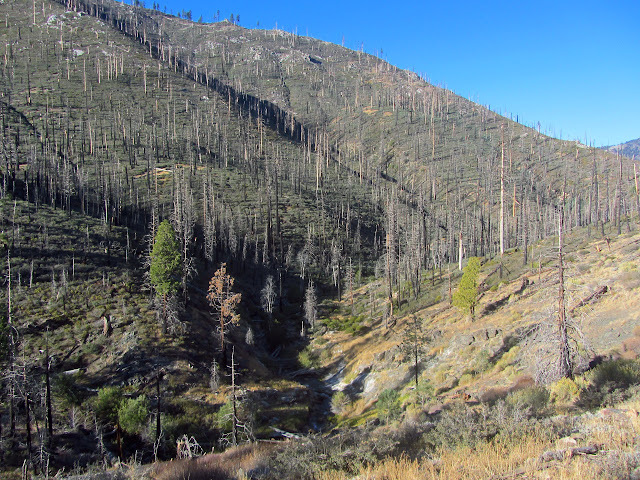 Adding on things like the Coyote Peaks is tempting, but the report that Deep Creek, the major water source on the way, is dry somehow dampens that idea. A climb up Kern Peak seems necessary. Blackrock Trailhead on the Inyo side actually makes a bit more sense, but is a fair bit longer drive. 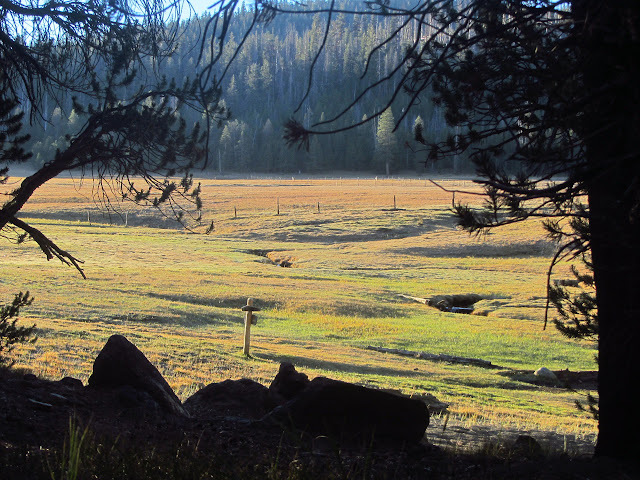 Jerky Meadow is another popular trailhead with similar access to Lewis Camp. Signs could be better for getting to Lewis Camp. I turn at the big advertisement sign for the Golden Trout Packtrain at the end of highway 190 because that is in the same direction, and found confirmation that I was going the right direction up the road rather than the more usual method of having a sign to point out the turn. Ignoring the small roads and taking a right at the Y as the pavement ends gets one to a large loop for trailer parking and second parking area among picnic tables. Both have trailheads at the end, the one by the tables including a map with a couple out of date details that once held a register. Below, there are many ways down, but a general downhill movement will not result in getting lost. A small granite dome a short way to the north as the trail starts the descent to the Little Kern River. The pack is loaded with eight nights of food, one day extra for the trip planned. The first few days have a low chance of thunder storms and the sky looks like it will not do anything, after that it should be clear. Unlike the last trip, this does not mean I can chuck the rain gear. I trust the Sierras to rain on me at least once in a week. The first big viewpoint shows the apparently gentle southwest slope of far off Mt. Langley peeking out over closer peaks. An old sign and a new sign mark the edge of the wilderness as the trail drops. Trails drop off to Grey Meadow to the north, usually with a sign, and one comes in from Jerkey Meadows to the south but is not well signed. 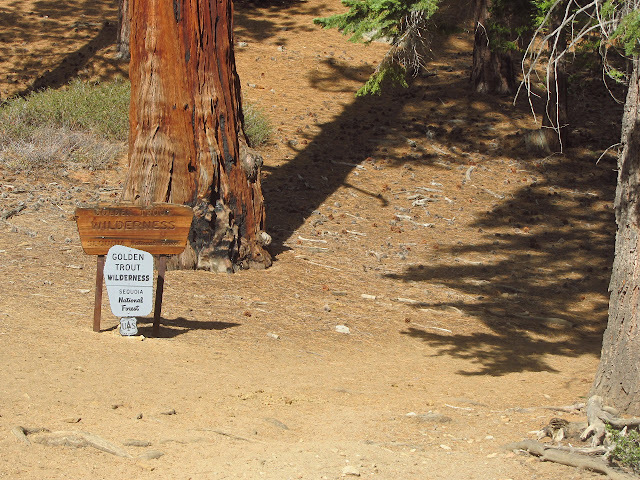 An old wood sign and a new plastic sign mark the entry into Golden Trout Wilderness. Behind them stands a huge cedar tree rather than the forest namesake redwood. Distant peaks including the bald Langley to the right. I decided to finish off the day with a drive down the Mulholland Highway and a short benchmark search in Leo Carrillo. 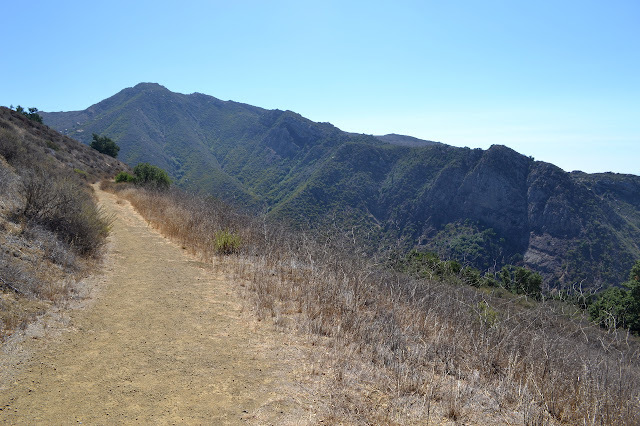 The trails make a loop around a small peak by the ocean and a spur climbs it from the north. The benchmark is on the top of this same peak, so it should not be hard to find. Leo Carrillo also requires a $12 day use fee to park in the lot, but a single payment covers all the state parks for the same day. Free parking can be had on the far side of the Pacific Coast Highway. I decided to start along the Willow Creek Trail, since I have not hiked that one before. It follows along above the highway which has quite a bit more traffic than Mulholland before turning up a canyon and starting to lose the traffic noise. It is still quite warm even by the ocean and with the wind blowing nicely. 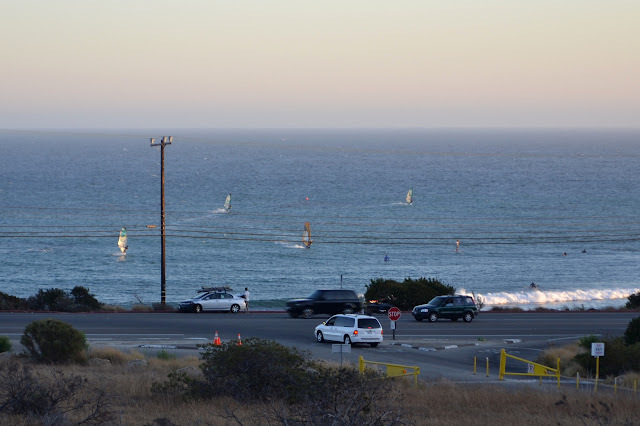 Both windsurfers and kite boarders are out today and even windsurfers are kicking up big wakes. Windsurfing seems to have been replaced by kite boarding, but there are plenty out today. For a $12 day use fee (or free parking along Mulholland Highway and a bit further to walk in with more hills), Malibu Creek State Park offers quite a lot of easy hiking past popular swimming holes to the extremely un-Korea-like part of an old Paramount movie ranch where MASH was filmed. (A number of other movies and shows were also filmed there and in an old 20th Century Fox movie ranch on the way.) It seems like an excellent hike for an extremely hot day. A sign points to the "backcountry trail", which seems a bit of a stretch for the set of stairs leading down to an initially paved road leading to a large visitor center past a detailed information sign. 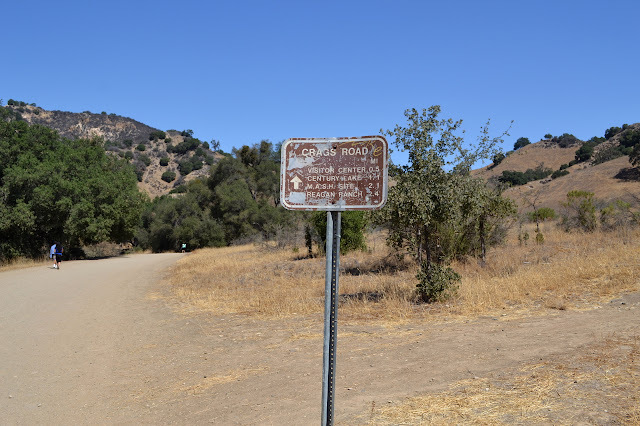 The road crosses over the first swimming hole, a deep spot just below it in Las Virgenes Creek, then launches into the dry and hot park past the first of many signs pointing the way. It tells me that if I go a little further, I can visit something called "Reagan Ranch" as well. Starting to hike with a few others. The signs are in better shape as they are further from the trailhead. 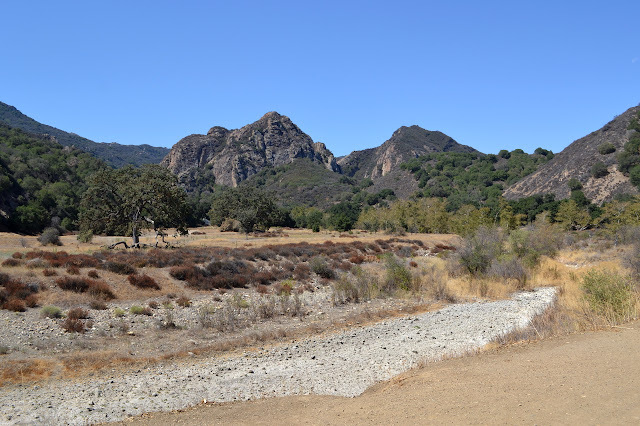 The road quickly splits, the left leading to the visitor center and Rock Pool, the most popular swimming hole, and the right making a wide curve above the large, dry wash of Malibu Creek. The people taking the trail are mostly in swimming clothes, often with towels draped over their heads. A kid in front of me is in such an outfit accompanied by a mom in a knee length skirt tight enough to force her to waddle and fashion sandals, and she is not the only one without anything approaching appropriate attire for a walk. There are a few hikers as well, and as I continue, they are quickly the only ones left. 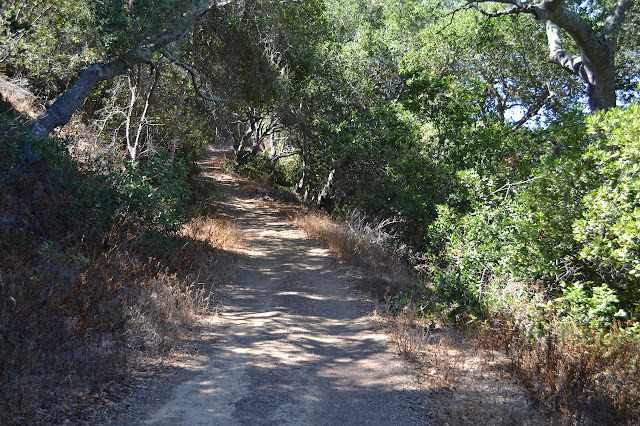 I take the high road to the right and quickly get a little bit of shade under massive oaks. Occasional picnic tables offer rest points in the shade. Malibu Creek does not seem to offer much hope for a swimming hole ahead. The Visitor Center is just visible below Goat Buttes in the background. In looking at the benchmarks in Gaviota in the NGS database, I noticed quite a few of them are referenced to "weather vane". Curiously, this point is up high on the ridge south of Gaviota Peak. There is no information on this point except the name, location, and identification number. It seems likely that this was not a monument, but an actual weather vane, an item that usually sits on top of something else. What might it have been sitting on, if it was? Is there anything left of it? One way to find out would be to go and look. It also gives me an excuse to explore east along the ridge a bit further. It might be tempting to do it via a much lesser known route just on the ridge, but I go for Trespass Trail. There is some construction in the lot and along the road, but there is still parking for state park users. The trek up to the saddle is the usual hot and exposed route with a single reprieve. Along the one reprieve from the sun on the way up. While in the state park, Trespass Trail is really a road. Out in the sun and circling around to the south face of the mountain for the first real view of the ridge. Camp Tecuya may have been "my" camp and I knew every inch of the grounds after all the winter weekends, summer weeks, and staff working weekends, but Camp Mountain Meadows was my favorite. They offered multiple camp units for backpacking. One for beginners did a 3-4 day trip, another did a 5-6 day trip, and a third did at least 2 weeks on the John Muir Trail. (My recollection is that they through hiked it in 3 weeks, but it seems unlikely that memory is accurate.) It is the only camp that had a camp song, and yes, I do remember it. I have since heard it sung with another camp's name inserted and suspect it is just a standard one. For some reason, the songs we sang there seemed a little more sophisticated. "On the Loose" and "Moon on the Meadow" were absolute favorites and one counselor would get out her guitar and sing "Big Yellow Taxi", so when a cover later got lots of radio play it lead to happy memories of camp for me. I am going to say it was 1989 when I did the shorter backpacking unit. We learned about compasses and maps and how the two work together. We learned about essentials and were forbidden any watches as we packed. We were dropped off at Forks of the Kern, at the end of the road just past a boy's camp. We were headed across to a second trailhead where we would be picked up at the end. 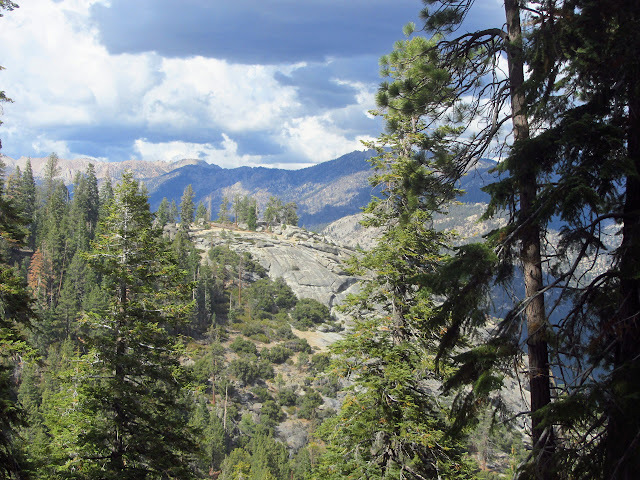 From Forks of Kern, the trail drops just over 2 miles to the Little Kern. I think we may have camped here, but I only remember the last camp site (which was here) for sure. This was a fun bit of water, quite wide but not even up to our knees as we waded through it barefoot. After the Little Kern, we hiked on to the Kern River and started hiking up it toward a foot bridge. We were not making good time, and it was decided we would trim the trip a little by using the ford instead of the bridge. The Kern River proper is nothing like the Little Kern. The water is swifter and much wider and quite cold. For this crossing, we were instructed to remove our socks, but put our shoes back on because we needed the footing. The head counselor decided we should cross one at a time and she would carry our packs so we would not have that burden if we fell. The river was up to our knees at first, then up to our thighs, and at the far side up to our waist. I was last and by that time the cold water had gotten to her and she stumbled toward the end. It just meant there was a little moisture on a synthetic sleeping bag, but it was a good thing there was not another one of us. After the river, we struck out across a very dry and very flat area with well spaced trees. Cow paths intertwined with and obscured our trail. We quickly took to following the blazes instead of the trail. Unfortunately, no one blazes trails anymore. Even if they are all there, the next one tends to be just a little too far away to find. Without upkeep, fallen trees remove blazes, new growth obscures them, and sometimes the tree heals over. Eventually, we lost the blazes as well. We continued on, but not in the right direction. Out came the compass and map and while some sorted out a route, the rest of us learned to use the compass as our missing watches. Just point a hand to the north and look our your shadow. The arm is the 12 and your head points at the time. A few refinements for the season or being after 3 and you can be within 15 minutes pretty reliably. It was decided we would climb a local peak, so up the hill we went. It was not a hard climb and when we got to the top, we dropped down the other side. Only we didn't drop down any other side. We were still too close to the Kern. We hit a creek and could not help but notice the perfect water slides between two of the pools. We slid and splashed for a couple hours in the afternoon heat before continuing on, roughly back the way we came. We dropped back down to the Kern and followed it until finding a spot that looked good to cross. A tentative crossing to test it showed that this crossing was much easier than the official ford. With boots and packs on, we crossed, this time in a small cluster. The water only came up to our knees and was not all that swift. 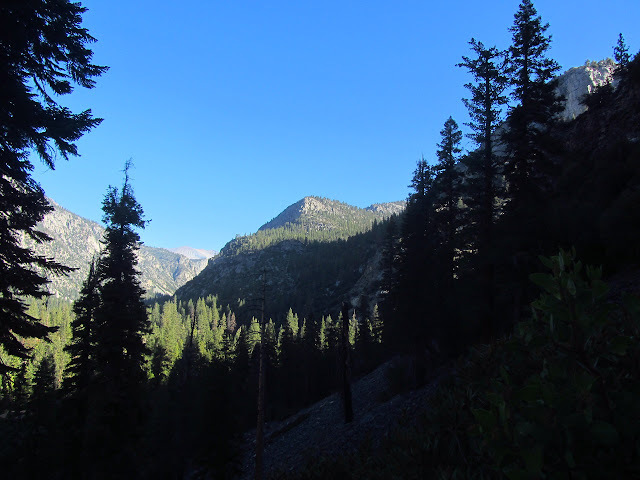 We quickly found the trail on the other side and followed it back to the Little Kern to camp. At camp, we managed to have something else go wrong. While collecting water that evening, we sucked a minnow up the tube of the First Need and pumping came to a dead stop. I actually think it was the second minnow we had got with the filter. Prefilters were not common then and only a few people were finding it all worked a lot better if you tied a bit of tee-shirt over the end. We tried, but could not fix the filter. In the morning, we ended up boiling water for the hike back up out of the canyon. It was a long time before that water was cool enough to drink. Oddly, the small sips we took of the hot water sated our thirst just as much as a larger sip of cold would have. We hiked to the boy's camp to call our ride and get it redirected to where we actually were. The boy's camp ended up being an adventure too. They were very generous to us and invited us to join them for lunch, although at our own table. There, each person at a table went over to each of multiple stations to get plates, silverware, and dishes of food to bring back to the table. We were sat at one table just before the boys came in with a giant ruckus. They quickly gathered everything and dropped it on their tables. The dishes of food emptied out onto the plates and the plates emptied out into the boys, then they shuffled off for washing tubs and clean dishes were returned. Somehow with all that eating, the ruckus never quieted. It all took them a half hour, then they all rushed out and it was quiet. We were maybe half done with eating and finished at our own pace, then followed suit with the washing. While we waited for our ride, we were pointed at the soda spring that bubbles up at the edge of the local creek and given packets of flavored powder so we could enjoy sodas. The creek had nice little wash tubs and so we had another hour or so of water fun with natural fizzy water. All in all, it was a most excellent complete failure and we loved it in almost every moment. That first Kern crossing was a little worrisome.